Music is one of the main reasons why Arambol is such a special place. Arambol Musicians start flocking to town from all over the world in November and usually stays for the whole season, bringing a massive amount of energy and creativity. In a whole life of traveling, I have never seen such a flourishing music scene. Not even close. Arambol Musicians not only play their music: they start new projects, explore styles and original mixes between genres. 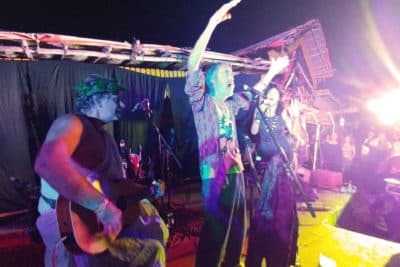 In Arambol you can easily listen to Irish folk mixed to a gypsy melody, electronic looping with traditional Indian instruments, meditative mantras hip-hop. The sky is the limit. In Arambol streets, during high-seasons, there are more musicians than cows. And we are talking about India! Everybody is playing an instrument here. Some are doing covers, but many have their original music. 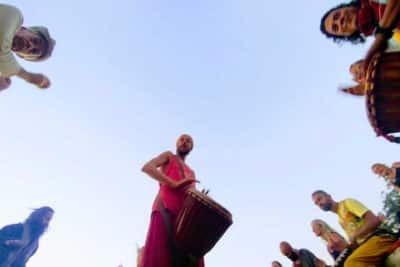 You can meet Arambol musicians virtually anywhere here. Have a chai in Arcan bar on a sunny afternoon, and you will hear them jamming on a new song or rehearsing for the upcoming gig. You can listen to them at Arambol beach at sunset, playing alone in front of the Ocean or singing aside of the drum circle. 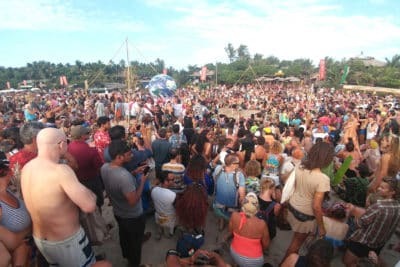 You can visit Arambol Carnival in February and see them all, performing together in a blast of wild happiness and positive vibe. Some Arambol musicians also perform off-season, in Europe, US, Asia; some others just play here and do something entirely different when they are back in “The Matrix.” Some make good money out of it, while some other can barely survive. Some are young and willing to make a whole life out of their music; some others are in the autumn of their lives and just want to share happiness and good vibes. Arambol musicians: who are they? Although there are Thousands of musicians in Arambol, some of them make the difference. The reasons are many, and tradition is one. Because, you know, some of them have been coming since the Seventies! And yes, they were hippies living naked at the beach. Now, some of those old-timers are living legends in Arambol and still perform. Who am I talking about? Let’s see, check out this essential list of the Arambol Musicians. Attila came to Arambol in the earliest times. He is a rock star here. He is a solid acoustic bass player and performs with the psychedelic rock band: The Saints & The Fouls. You can see him during the min season in Arambol at Fellini or Revolutions. And yes, it’s true: he often strips naked during his concerts. John Paris is a bright light that shines in Arambol beach since 1965. An Englishman who sings his music with an accordion to almost all open mics here. How is he? In a word: amazing. His simple songs all talk about love, life and how precious they are. When he starts singing all the community here stops and sing along. All Arambol musicians love him. 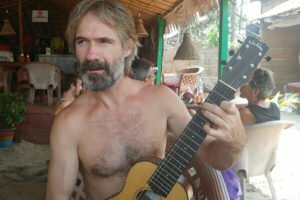 Irishman in his 40s, Anthony is the rising star in the Arambol music scene. 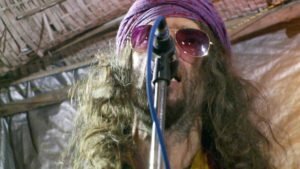 With his band, The Tantric Monkeys, he sings about pain, life experiences, traveling. Buy he got famous because of one song in particular. It is called Arambol and quickly became a sort of anthem here, sung everywhere by everyone. Anthony is also the MC of the most loved Arambol open mic, which happens every Monday evening in Twice in Nature. Sissi is another rising star in Arambol. She is a well known German comedian who decided a few years ago to spend most winter seasons in Arambol. Her shows are a unique combination of creativity, humor, and intelligence. Sissi will make you laugh at loud and think at the same time. As told, Arambol musicians are many. This preliminary list is not comprehensive. I will add names as soon as I have time.